Will You Survive the Legal Marketing Apocalypse? I have seen many horrors. Good women and men – former colleagues, in fact – turn from exuberant, bubbly marketers into brainless hordes of life-sucking zombies. It’s the kind of thing you thought was only possible in the movies, but I’m telling you – as one of the last among us with my faculties still intact –it’s a very grim reality. I still recall what it was like, long ago, during the halcyon days. Legal marketing flourished. Jobs were secure and plentiful. And strategies were tried and true: Print a brochure, build a website, run some ads, conduct some PR, host an event. Life was good. But something happened. Things started to change. Routine created stagnation. Years passed and the stagnation spread across the country, affecting legal marketers far and wide. Slowly it began to mutate their very beings. The glow receded from their eyes; their skin took on a sallow hue, matching that of the drab lighting above their gray cubicles. They shuffled down corridors without direction; they executed attorney demands without thought. If they had brains, they weren’t using them. And they hungered. It’s a miracle I survived myself. I was working as a marketing coordinator at a law firm in Atlanta. A recent graduate, I was a fresh face with big ideas. But no one would listen. To them, I was just an “inexperienced millennial.” The most obstinate was our CMO, Carol Anne, who did anything she could to retain the status quo. I remember when I went to her office to tell her about how we could cull litigation data from across the state to gauge which jurisdictions were key targets for our marketing efforts. She just laughed and told me to go back to compiling ranking submissions. Every idea I had – from automated marketing to native advertising to social media monitoring – was shot down. And with each rejection from Carol Anne, I saw a transformation. Her hair began to thin, her skin peeled. Soon her pupils receded, and her nails grew into gnarled claws. The day I knew I had to flee was the day I walked into the conference room to find that she had torn the heads off our executive committee and smeared their gray matter all over the walls. It was a literal brainstorm. 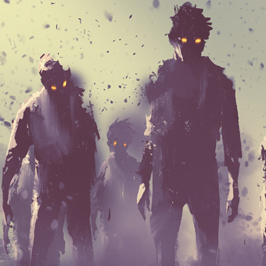 Now I walk among the undead, the shuffling throngs of zombified legal marketers, searching for other survivors. Most of the creatures ignore me, just as they did when they were still human. The only thing that keeps me going is the knowledge that there are others out there like me – legal marketers with a vision of a future beyond the legal marketing apocalypse. If we can just find each other and create a new world for ourselves – one in which innovation and experimentation are valued, in which failure is embraced as feedback that improves strategy, in which technology becomes an indispensable tool – then we can breathe life back into our profession.